Labor doesn't want to remind people of its government with the Greens, and the Liberals are shy about a policy even the timber industry doesn't want. The contrast could hardly be greater. In 2014, as Will Hodgman returned the Liberal party to power in Tasmania after 16 years in the political wilderness, central to his pitch was a bold promise: he would tear up a forestry peace deal and immediately convene meetings to rebuild the industry. It was a remarkable and effective stance. Remarkable because it came despite the timber industry and the union and environment movements reaching an agreement meant to have ended the decades-long Tasmanian forestry wars. Effective because it registered strongly in regional areas, helping the Liberals score a landslide victory. Four years on, for the first time in more than a generation, native forestry is missing-in-action as a political issue. Two days before the poll, neither of the major parties has released a policy. Beyond some acknowledgment of its absence on the ABC, it has barely been mentioned. Matthew Torenius, a sawmill owner, says it is a similar story on the ground. In the last campaign, his mill at on the Tasman Peninsula was visited by candidates from both major parties as they looked to promote their policies. This time? "Haven't seen one." Political observers say there are obvious reasons neither major party wants to talk about native forestry. For Labor, it is a potential reminder to the electorate of what is widely seen as a failed experiment to share government with the Greens. For the Liberals, it might mean facing questions over why they remain committed to a stance the industry mostly doesn't want. Despite the silence, it remains a sleeper issue almost certain to rear its head in the next term of parliament. The peace deal was meant to protect 504,000 hectares, including long-fought over areas such as the Styx and the Upper Florentine, and put the industry on a sustainable path. Of these, only 100,000 were formally reserved, listed as an extension to Tasmania's world heritage area. Under the Liberals' plan in the last parliament, the remaining 396,000 hectares of these native forests held in informal reserves - in the Tarkine and Wielangta, on Bruny Island, along the east coast and in the north-east - would have been reopened to logging this year. 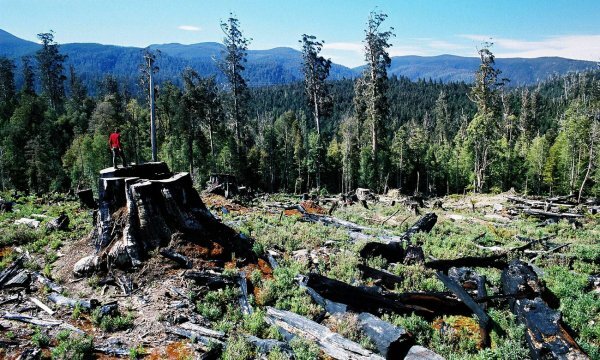 Legislation was blocked in the state's upper house last year, an outcome welcomed not only by the environment movement but also the Forest Industries Association of Tasmania and several sawmill owners concerned it could reopen conflict over the industry's legitimacy. Working with the-then Abbott federal government, Hodgman had previously tried to delist 70,000 hectares of the world heritage forest extention to open it up to the timber industry. While this was rejected, his government made one significant change - amending regulation to open up longstanding rainforest reserves to specialty processers who use less common types of timber, such as red myrtle and Huon pine. While the issue is not being discussed - the resources minister, Guy Barnett, was not made available to be interviewed for this story - the Hodgman government remains committed to its policy of unwinding the informal reserves, which take in the bulk of native forest not included in the world heritage area. While its plan to open up the forests this year was knocked back, it did pass legislation that changed the informal reserves status from "future reserves" to "potential production forest", and introduced a sunset clause that makes them available to the industry from 2020. With that date two years away, it means a returned Liberal government may get its way whether it legislates or not. Wilderness Society Tasmanian campaign manager, Vica Bayley, says the government has failed to explain where it will find a market for the timber. The forests cannot be managed by state-owned Sustainable Timber Tasmania (which was known as Forestry Timber before being rebadged last year) as it would likely hurt its already stalled bid to win forest stewardship council certification, the international accreditation it needs to keep selling its wood. The government's solution is to open up the reserves to the private sector. But there is little sign it wants it. "It's a cynical and political position," he says. "The truth is the cost of producing the log is typically more than they can sell it for. Native forest logging is a loss-making venture and Premier Hodgman continues to subsidise the industry with tens of millions of dollars." Bayley says the forests should be added to the existing national park network, which underpins the state's booming tourism industry. "These forests are all in places that need jobs. If you give people things to do in them - put in signs and toilets, upgrade tracks - then people will stay longer in the regions. They'll eat in the cafe, stay in the pub, put dollars into the local community." Torenius, a former finance analyst who returned to the family saw-milling business five years ago, says the Liberal party has been a big supporter of the industry, but few want to deal with timber from contentious areas or to see old battles reopened. There remains a market for high-quality native forest timber - "look at the popularity of architectural shows and renovation shows on TV," says Torenius - but the main concern with the peace deal was whether there would be enough logs available. "So far, I'd say Sustainable Timber Tasmania has met the obligations they needed to." He notes the peace deal had led to hardship and could have been better handled by the then Labor government, particularly in the small communities where sawmills had closed. Since the collapse of Gunns five years ago, the industry has been vastly reduced. Where the state-owned forestry business used to be required to make 300,000 cubic metres of sawlog available to industry each year, that is now 137,000 cubic metres, and demand last year was even less than that. "It is really a boutique industry," he says. Torenius says his goal is to use the timber available to reach high-value markets. "For me, it's not really about making the pie bigger anymore. It's about increasing the value of the pie we have." The forestry peace deal was never absolute. The version that passed parliament was opposed by the state's most celebrated environmentalist, Bob Brown. His organisation, the Bob Brown Foundation, continues to protest in logging coupes in Tarkine rainforest that would not have been protected under any version of the agreement. Both major parties have said they oppose the creation of a Tarkine National Park, a push backed by some in the tourism industry. In the south, there is ongoing conflict over logging of forests that are visited by the endangered swift parrot, while the state has a growing plantation timber industry that is starting to produce mature trees. These issues have mostly burbled in the background of the campaign. Torenius says he expects people like it this way. "I think Tasmanians have for a long time been bloody sick of the argument, on both sides." Bayley says it is not guaranteed to stay that way if the current impasse over the near 400,000 hectares of native forests isn't resolved. "Our interest is in protecting forests, that is what our members support us to do. In the wake of Saturday's election, it's incumbent on us to have a look at the political landscape and consider the best way to do that, with all options on the table."